Join Laura Kay every fourth Thursday of the month from 1 p.m. - 7 p.m. to cut or sew pillowcases for the local chapter of ConKerr Cancer! It is a fun time to sit and sew while making a difference in the day-to-day lives of these precious children. Each pillowcase brings a smile to a child! 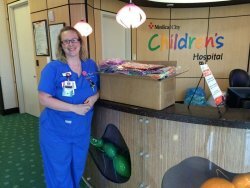 Don't you want to be a part of putting that smile on the face of a child at Children's Medical Center (Dallas and Plano) and Medical City Children's Hospital (Dallas)? Happiness Is ... Quilting! is a drop-off location for pillowcases. Please wash pillowcases (to sanitize for hospital use) and place each pillowcase in an individual ziplock bag before dropping them off. More information about ConKerr Cancer Dallas/Fort Worth can be found on HIQ's website. Including different ways you can get more involved. Can't join us? You can make them at home! When we deliver the pillowcases to the local children's hospitals, everyone gets excited. And, we wanted to share the excitement with you by sharing what has been going on and how you can get involved. 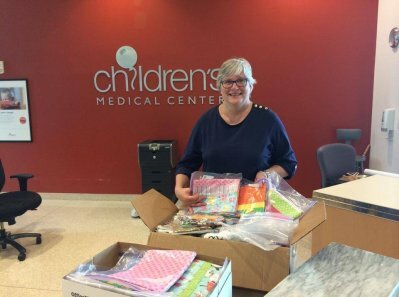 Many thanks to Penny for helping me deliver 91 pillowcases to Children's Medical Center at Plano! Thank you so much to all the ladies at the retreat at Greenbriar Retreat Center last weekend who helped me with pillowcases for the children's hospital. I appreciate you giving your retreat time for this great cause! Angel was so excited about the 50 pillowcases I took to the hospital. 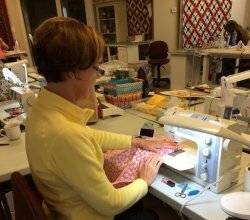 Thanks to all of our customers, especially McKinney Quilt Guild members, who helped sew the kits we cut at our workday. You're going to brighten the day of a child who is in the hospital over the 4th of July. 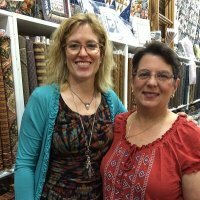 Vicky from Stitchin' Heaven stopped in the shop on Saturday to talk to Laura Kay about getting involved with ConKerr Cancer. Stitchin' Heaven is a new drop-off location pillowcases. Pillowcases collected will be combined with pillowcases collected at Happiness Is ... Quilting! and delivered to the children at Children's Medical Center (Dallas and Plano) and Medical City Children's (Dallas). Want to keep up with what's happening locally? "Like" ConKerr Cancer DFW's Facebook page!